Ghandi’s simple but symbolic act of defiance came after setting off with seventy-eight of his followers on a 24 day march to Dandi on the sea, a distance of some 240-miles (390 km), where he and hundreds of protestors violated the law by making their own salt. It sparked a mass campaign of non-compliance throughout the Indian subcontinent in protest against Britain’s Salt Acts prohibiting Indians from collecting or selling salt. Nearly 60,000 arrests were made, including Gandhi’s. Indians were forced to buy the mineral, a staple in the Indian diet, from the British, who not only exercised a monopoly over the manufacture and sale of salt but also enforced a heavy salt tax. The march known as the Salt Satyagraha, was a direct action campaign of tax resistance and nonviolent protest not only against the British salt monopoly but against British rule in India. The campaign had a significant effect on changing world and British attitude towards Indian independence and caused large numbers of Indians, Hindus and Muslims alike, to join together to fight against the British regime. It elicited world wide support for the Indian cause and spurred the British to withdraw a number of repressive laws and to promise not to prosecute resisters. Gandhi’s Salt Satyagraha was a decisive blow against British imperialism and the catalyst for a wider Civil Disobedience Movement, which ultimately led to independence in August 1947. The 78-year-old Gandhi was assassinated by a Hindu extremist less than six months later, on January 30, 1948. 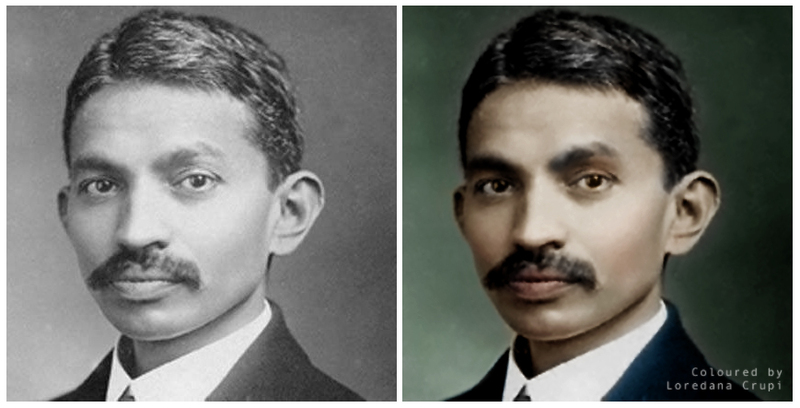 This entry was posted in Britain, Colorization, Colourisation, History, India, Photography and tagged British Empire, Loredana Crupi, Mahatma Gandhi, Mahatma Ghandi, Mohandas Karamchand Gandhi, Opus Loredana, Salt Satyagraha. Bookmark the permalink. My country’s past is so abysmal, yet now we are the most cosmopolitan of nations, for all our faults. Ghandi was a great man, love the colouring, really brings life to the subject. Thanks, Fraggle. He certainly was a pillar of enlightenment!